Liverpool legend Jamie Carragher’s future at Sky Sports looks in some doubt after footage emerged of him spitting at a 14-year-old Manchester United fan. The former Reds defender has apologised publicly for his behaviour, as well as to the family concerned in the video, but it may be that he’s landed himself in hot water with his employers. The Daily Mirror broke the story last night and now report that Carragher is set for ‘showdown talks’ with Sky following the incident being made public. Here’s that SHAMEFUL video of Carragher spitting at a Man Utd fan – should he lose his job at Sky over this? It certainly doesn’t look good for the 40-year-old, with the video very clearly showing how the incident unfolded without a huge amount of provocation. 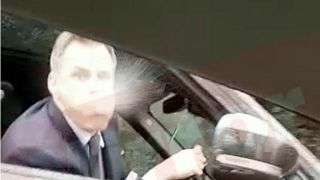 A United fan filmed from his car as he noticed Carragher driving alongside him, before encouraging his daughter in the passenger seat to roll down her window so he could taunt the pundit over the result at Old Trafford, and it didn’t take long for things to escalate as Carragher aimed a large amount of gob right at his daughter. Carragher tweeted that he’d been goaded by several fans in his car after Manchester United’s 2-1 win over his former club Liverpool at the weekend, but he added that that did not excuse his behaviour. Widely regarded as one of the finest pundits in the game, Carragher has long been respected in football media and would certainly be a loss to the industry were he to find himself axed by Sky. However, there’s no question his behaviour crossed a line here as he massively overreacted to what was some fairly standard football fan banter that never even hinted at abusive.